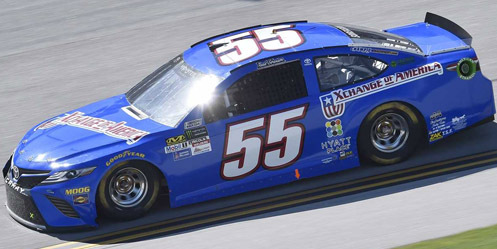 Reed Sorenson picked up the 15th last-place finish of his Monster Energy NASCAR Cup Series career in Sunday’s GEICO 500 at the Talladega Superspeedway when his #55 Xchange of America Toyota was involved in a single-car crash after 72 of the 191 laps. The finish, which came in Sorenson’s 271st start, was his first of the season and first in Cup competition since last August at Pocono, 25 races ago. 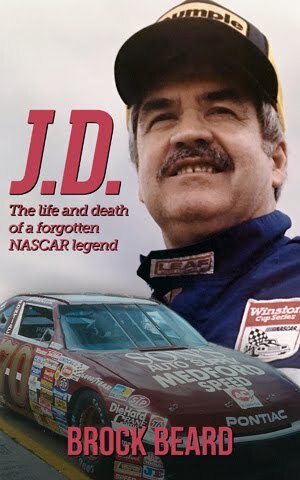 He now stands tied for the 10th-most last-place finishes in Cup Series history, joining Buddy Arrington, Ward Burton, Richard Petty, Roy Tyner, and J.J. Yeley. Sorenson rounded out the 2016 season with 28 starts in 36 races. While his best finish of the season was a 22nd-place run in the July race at Daytona, it was at Talladega that fall where he turned the most heads. The Premium Motorsports team went all-out in qualifying, securing the top speed in Round 1 before settling on 12th on the grid. Back with Premium for this season, Sorenson looked to repeat this success at Daytona, but in his Can-Am Duel was wrecked out of the final transfer spot by Corey LaJoie. A subsequent streak of short fields kept Sorenson in the field for the next eight races, where this time he ran Premium’s primary car, #15, previously driven by a retiring Michael Waltrip to a 8th-place finish in the Daytona 500. Coming into Talladega, Sorenson’s best run of 2017 was a 28th last month at Bristol. The team’s second car, #55, had most often been driven by veteran Derrike Cope, who himself has finished no better than 31st in the same Bristol race. Cope wouldn’t run at Talladega, however, as Premium had already announced that XFINITY Series regular Joey Gase would drive the #15 with sponsorship from Sparks Energy. This would again move Sorenson from the #15 to the #55. Sorenson would run a bright blue Toyota with sponsorship from Xchange of America, one of four companies to sponsor the Georgia driver’s car this season. Xchange last sponsored Sorenson at Texas, where he ran 35th. Sorenson was one of 42 drivers on the preliminary entry list – a list that contained all 42 teams which attempted the Daytona 500. By Friday, the effort was made somewhat easier when Rick Ware Racing withdrew their #51 Chevrolet for the first time this season, putting one Open team out of the show. The goal now for Sorenson was to run faster than one of the remaining four Open teams to make Sunday’s race. Unfortunately, weather refused to cooperate on Friday, and Daytona rival Corey LaJoie was the only Open car able to turn any laps before rain stopped the session short. In the end, Sorenson put up the 33rd-fastest lap of 186.119mph, second among the Open teams to Brendan Gaughan and the #75 Beard Oil Distributing Chevrolet. This time, joining the Ware team on the early ride home was Canadian D.J. Kennington, who ran the fourth-slowest time in the Gaunt Brothers Racing #96 Triad CNC Toyota. 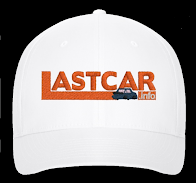 Starting last on Sunday was current 2017 LASTCAR leader Jeffrey Earnhardt in Circle Sport with The Motorsports Group’s #33 Chevrolet, to be joined before green by Gaughan, whose Beard team had to change a flat tire during qualifying. By the time the green flag dropped, however, both Earnhardt and Gaughan were already in front of Sorenson, who had fallen to the rear of the field. Just as the leaders poured off Turn 4 to complete the first lap, Sorenson suddenly slowed and turned onto pit road, then turned to the garage area. Just like his first-round speed last fall, Sorenson’s fast qualifying lap on Saturday was due to a purpose-built qualifying setup used by the Premium Motorsports team. In order to give their car the best shot at making the field, the #55 was given fluids designed for short runs, but not for 500 miles. With the cars impounded after qualifying, this meant the fluids had to be changed in the garage after the race started. LaJoie and his BK Racing team apparently employed the same strategy as he was a couple stalls over in the garage area by Lap 3, the crew anxious over the radio to make the changes as quickly as possible. 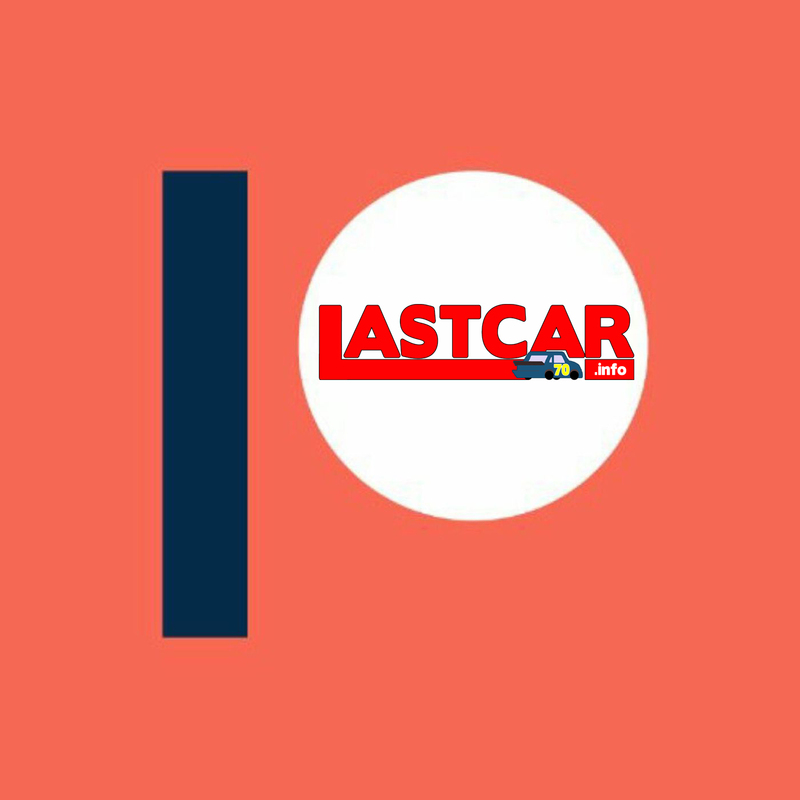 Curiously, the strategy did not run afoul of the new “Crash Clock” protocol for 2017, which still allows cars to return from the garage after repairs for mechanical issues. Purposefully switching over from qualifying to race setup apparently fell under the definition of repairs for “mechanical issues,” and first Sorenson, then LaJoie returned to the race, each 8 laps down, with Sorenson still last. By the time the two Toyotas returned to competition, two more small teams had also fallen laps behind the leaders. Both Brendan Gaughan and Jeffrey Earnhardt had rear-ended another car at the start of the race (perhaps each other since Earnhardt qualified 40th and Gaughan was sent to the back for the tire change). Gaughan lost five laps as the team tried to cool the engine, which was spraying water as #75 sat on pit road. Earnhardt lost three laps for similar repairs, then lost a fourth from serving an apparent pass-through penalty. By Lap 17, when Kyle Larson drew the first caution of the day, Earnhardt, Gaughan, LaJoie, and Sorenson were already multiple laps down. 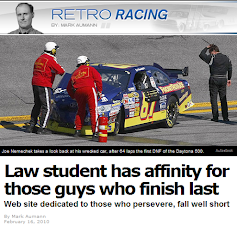 Sorenson was in last, closing within one corner of LaJoie when the yellow fell. On Lap 41, Sorenson lost a ninth lap when the leaders caught he and Jeffrey Earnhardt running by themselves in Turn 1. Sometime later, Sorenson reported a vibration on #55. Then, on Lap 82, Sorenson lost the right-front tire exiting the tri-oval and slammed the outside wall. Running nearly by himself on the same tires with which he started the race, Sorenson didn’t collect any other drivers and took one final trip to the garage, done for the day. He had been running in 40th from the very start of the race. Sorenson’s accident was the only wreck until the final 28 laps, when Ryan Blaney was nudged into another single-car accident by eventual race winner Ricky Stenhouse, Jr. Blaney, who ended up 39th, was eight laps behind the remaining three members of the Bottom Five, all eliminated in a grinding 16-car pileup triggered by A.J. Allmendinger and Chase Elliott. 38th-place Danica Patrick saw her day end much as it had last year, with her #10 Aspen Dental Ford slamming head-on into the SAFER barrier along the inside backstretch wall. 37th went to Trevor Bayne, who led 5 laps early and was still among the leaders when his #6 AdvoCare Ford piled into the wreck. Rounding out the group in 36th was to Austin Dillon, his #3 Dow Intellifresh Chevrolet pinned into the outside wall by Michael McDowell and Brad Keselowski. This same wreck allowed the other teams with early issues to finish outside the Bottom Five in 26th (Gaughan), 27th (LaJoie), and 28th (Jeffrey Earnhardt). *This marked the first last-place finish for the #55 in a Cup Series race at Talladega since July 30, 1989, when Phil Parsons’ #55 Crown Petroleum Oldsmobile lost the engine after 6 laps of the Talladega DieHard 500.